Cut from the same cloth as people who claim they don’t like red wine, there are those who go through their drinking lives with this on the tip of their tongues: “Oh, I don’t really drink dark beer.” Their aversion may come from a misplaced notion that all dark beer is like liquid bread: filling and heavy. While this is true in some instances—doppelbock has its origins in sustaining monks through their fasts—there are plenty of dark beers that are refreshing and flavorful without being overbearing. When porter-mania hit London at the turn of the 19th century, the way to make a beer dark was to load it with brown malt. Many breweries struggled to turn a profit as they poured load after load of the pricey malt into their kettles in an attempt to satisfy consumer demand. This changed in 1817, when an innovator named Daniel Wheeler invented black patent malt. Roasted in a manner similar to coffee, just a tiny amount of this malt would turn a beer black. Breweries were thrilled that they could create a beer’s backbone using cheaper pale malts, then adjust its color with black malt. This opened the door to dark beers in many different styles: crisp black lagers, dark saisons and even black IPAs. Here are 10 fantastic dark beers that defy dark beer stereotypes, from easy-drinking to adventurous. Guinness: It’s ubiquitous, but you’d be hard pressed to find a more approachable entry to stouts than this supremely sessionable brew. It’s also worth noting that Guinness is actually lower in calories than Budweiser. Also look for: Beamish Irish Stout. Left Hand Milk Stout Nitro: Because of lactose, a sugar that beer yeast will not ferment, a milk stout gets boosted sweetness and body without the alcohol going through the roof. The result is a slightly sweeter and fuller bodied take on the Guinness style, right down to the distinctive cascading foam that appears when that beer is dispensed on draught. With a load of R&D, Left Hand was able to put the experience into a bottle, unleashing the falling foam through a heavy pour into your glass. Also look for: The Duck-Rabbit Milk Stout. Negra Modelo: If Mexican food is on my plate, this Vienna lager is in my glass. The slight malty sweetness balances the heat in spicy foods and it’s crisp enough to be refreshing. Also look for: Great Lakes Eliot Ness. Belhaven: This Scottish ale has richness and toastiness from darker malts and just enough hops to keep it vibrant on the palate. Think graham crackers and toffee rather than chocolate and coffee. Also look for: Odell 90 Shilling Ale. Hacker-Pschorr Dunkle Weisse: If Hoegaarden or Blue Moon is your go-to beer in the summer, consider a dunkel Weiss (literally “dark white”) when there’s a chill in the air. The gentle sweetness from the wheat, along with the familiar banana or clove notes from the yeast, is supported by a rich, caramelly, bread crust malt backbone. Also look for: Weihenstephaner Hefeweissbier Dunkel. 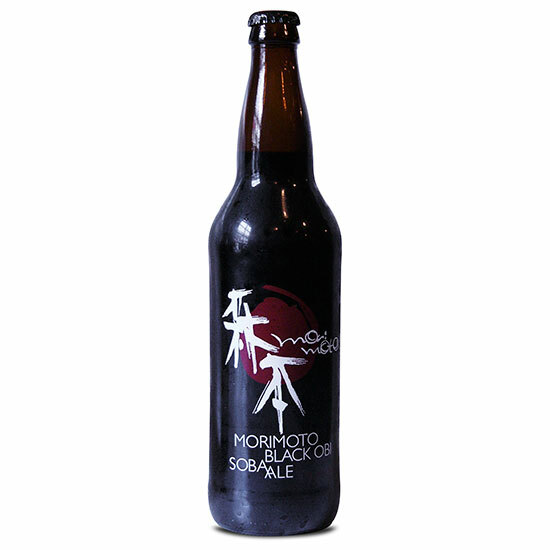 Rogue Morimoto Black Obi Soba: This is like a pale ale, just black instead of pale. Pine and resin notes from the hops offset the slight roasted, chocolaty flavors. Also look for: Victory Yakima Glory. Sprecher Black Bavarian: This American take on the classic German style schwarzbier uses dark malts to lend coffee and chocolate notes as well as a full-bodied mouthfeel, but the generous hops and the wonderful carbonation might make you reach for another. Also look for: Uinta Baba Black Lager. Westmalle Dubbel: A classic Belgian style, the dubbel is a rich, dark and complex beer. The color comes from caramelized candi sugar (a type of invert sugar used for brewing), and the legendary Belgian yeasts work their magic during fermentation, releasing fruit and spice notes. Also look for: Chimay Red. Petrus Oud Bruin: Sour beer sounds like something that you should be returning to the bartender, but in the Flanders region of Belgium, benevolent wild yeasts help produce pleasantly tart, refreshing beers. Oud Bruin (literally “old brown”) is a sweet-and-sour blend of ale aged in giant oak vats and sweetened with a younger ale that’s rife with fruity notes of raisins and plums. Also look for: New Belgium Lips of Faith La Folie. Old Rasputin: Think of Old Rasputin as the Rolls-Royce of beer: beautiful and easy to appreciate, but with an almost-frightening amount of horsepower under the hood. Russian imperial stouts are the darkest beers available and they tend to be among the most alcoholic. Balancing the alcohol and the roasty flavors are a high degree of residual sugar, bitter hops and a velvety mouthfeel that ties them together. Also look for: Oskar Blues Ten Fidy.